I'm so into fabrics right now. I have these times of the year when I have to replenish my fabric stash and sew, sew, sew! My favorite fabrics, beside the tea stained and soft pastel of my shabby chic style, are by Tanya Whelan. I love all the roses and polka dots. 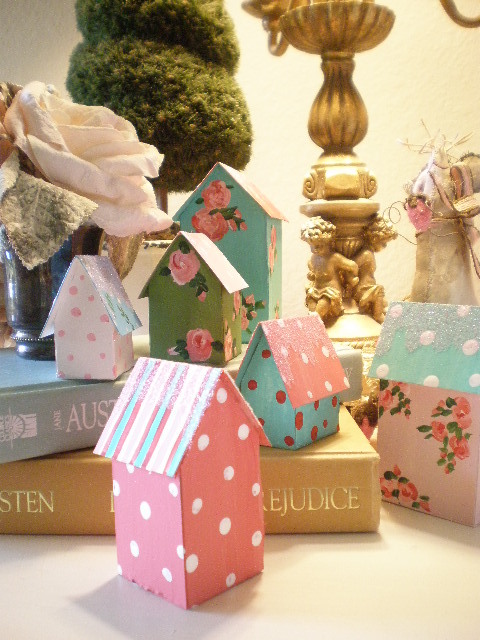 I decided to make little houses villages inspired by those designs. I've also done a couple more totes. Just to help someone look snazzy and whimsical when they go shopping! 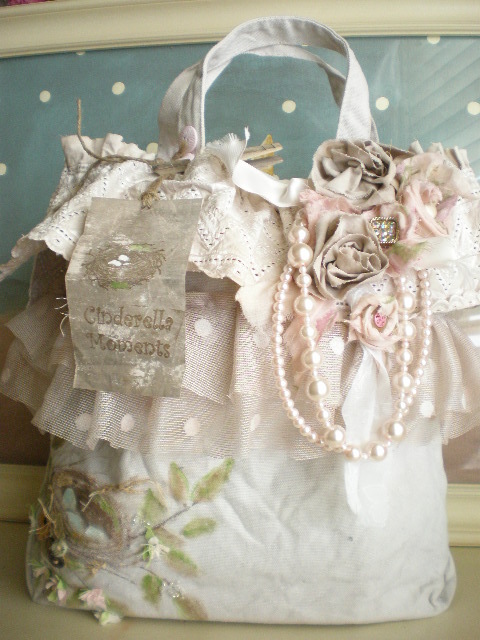 This one is tea stained, with a hand painted nest, pearls, roses and buttons. This one is pink with tulle and roses. You can check them out at my shop. I'm also gathering many ideas for the next dollhouse. I have a feeling it's going to be right along the lines of these bags. 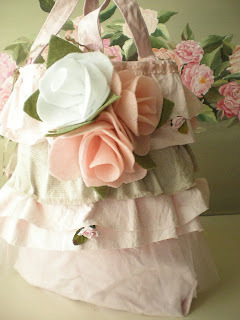 All girlie, shabby chic and whimsical! I also love the roses and polka dots. And the little pointed rooves. So cute. Good to hear from you and so glad all is well hon. Love your cute lil houses, the fabrics are so pretty, and your beautiful tote bags. Gorgeous! Can't wait to see your new doll house. Hello, Caroline! Long time, no see! I have been having "winter allergy issues" and have not visited many blogs for a few weeks. What lovely things you have been making! 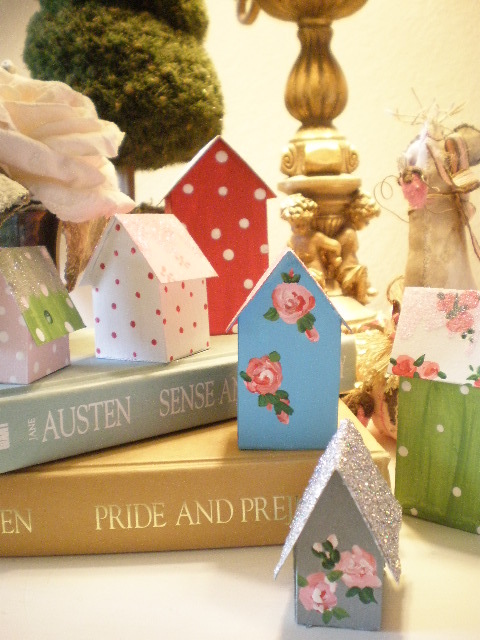 I visited your Etsy shop -- love the little houses and your totes! Especially love that turquoise tote -- GORGEOUS. You are quite the artist. Hope all has been well! You have one of the cutest blogs I have seen. Thank you for your inspiration! oh wow - please can I have them all !!! LOVE each and every little house. Hi Caroline, I haven't been bye for a few days with everything that is going on in my life right now. I like the looks of your blog and I like your new totes. I am anxious to see your next house, but I can see you doing a change. You are very creative regardless of what you are making. Have a great weekend. Your Missouri Friend.